Thousands of migrants from Honduras, El Salvador and Guatemala are heading north towards the US border hoping to find work and a better life. Estimates are that currently, some 12,000 Central Americans are on their way in three or four different ‘caravans’. 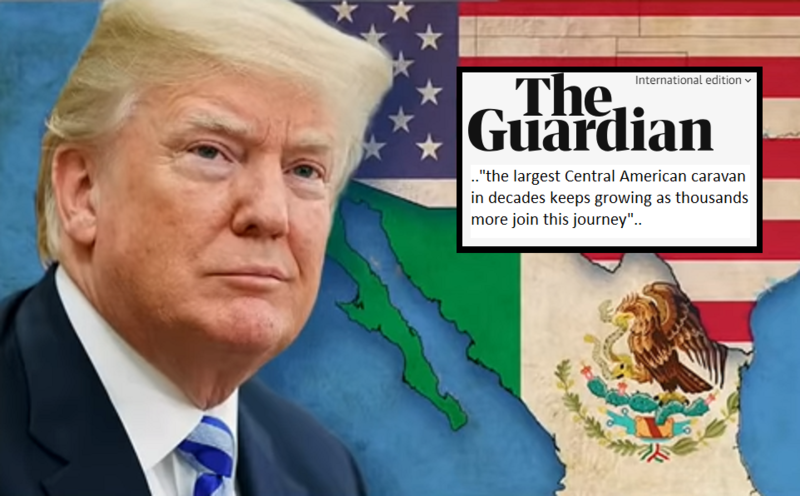 Although the mainstream media in the US slams the current White House administration for their reporting of the ‘caravans,’ even leftwing The Guardian stated in its international edition yesterday evening it is simply the “largest Central American caravan in decades” (see source). By now, it is largely understood that most of the migrants get help from organizers of various NGO’s operating in those countries to get them to start traveling in groups (as a safety precaution). The threat of the current White House administration, however, to strip the Central American nations of much needed financial aid if they allow more countrymen to march towards to US border has made sure the leaders of various countries in the region are now willing to take action. On Monday afternoon, both the presidents of Guatemala and Honduras made it known that they were calling for an investigation to identify the organizers of a caravan of migrants who are nearing the Mexican capital. Honduran President Juan Orlando Hernandez claimed that "thousands" of his countrymen have already returned to Honduras. However, those numbers did not correspond to what Mexico's Interior Ministry said over the weekend when it stated it only helped transport around 500 migrants who asked for assistance returning to their countries of origin. Some 2,793 migrants of the different caravans have applied for refugee status in Mexico in the past weekend. In response to the caravans making their way to the border, US President Donald Trump ordered US troops to be stationed at the Mexican border. Some 7,000 active duty troops were already earmarked to deploy to Texas, Arizona and California. The White House Administration also plans to draft an executive order which could lead to the large-scale detention of migrants crossing the southern border and bar anyone caught crossing illegally from claiming asylum in the US. Yet I prefer it goes simply, like some movie quote I seem to remember hearing… "You shall not pass!" They will arrive just in time to return home!! Our nation is defined by our sovereignty and has been since it's founding. In the past, any actions that threatened that soverignty was recognized as an act of war and was dealt with in an appropriate manner to preserve our national constitutional structure. Wars in the past have been conventional with the threat to our nation being obviously identified and our actions against those threats being responses that logically arose to meet the challenges. Today's dangers to our nation are unconventional. But threats they are. The seemingly endless procession of invading populace from other countries come with masked agendas and, just as the troops of our nation seldom know the ulterior goal of the powers that mobilize them, these caravan of brigands become a weapon for evil people who have conscripted them. Make no mistake, these caravans were organized to accomplish a goal nefarious to our national sovereignty. They are a national threat which was designed to disrupt and disable the established order of our society so as to allow for the dismantling of our governing order. The diabolical stratagem of this invasion is to use our own long established compassionate, benevolent civil and social rules against us to overcome our governmental powers and replace them with others dominion. We will NOT capitulate! Our country is ruled by laws and we will use our laws to mobilize all the might required to repell this evil! They used the same tactic in Palestine, putting the women and children on the roofs to during bombing so they could point the finger and accuse Israel of their inhumanity, after they themselves had fired first. These people coming are blind fools. Those who organized this should be the ones standing in front of a firing squad. COWARD BASTARDS!! !